BEABA revolutionizes children's nutrition helping parents provide the best for their babies and toddlers. Between nap time, bathing, grocery shopping, doctor’s visits and play dates, life isn't always easy with baby! At BEABA, they hear the needs of new moms. Since 1989, they have revolutionized children’s nutrition with one goal: to help parents provide the best for their baby, stress-free. That mission was realized with the creation of BABYCOOK, their signature product by designer, Jean-Michel Chaudeurge. From then on, modern parents have remained the inspiration for all their designs, as they strive to surpass their expectations, from practical function to pleasing aesthetics. BEABA offers an amazing assortment of feeding items, including plates, bowls, cups and utensils for babies and toddlers. Learning to use a spoon can be tricky for toddlers. Béaba makes it easy with the 360° Spoon. 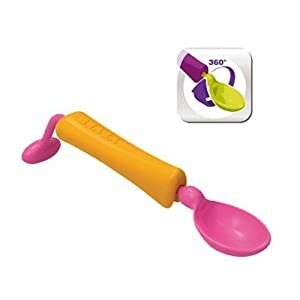 Designed for children learning to self-feed, the 360° Spoon's innovative rotating handle ensures the spoon stays horizontal, preventing spills from occurring when spoon is held incorrectly. The rotating handle can be locked into place for use by older children or to help with the transition to a traditional spoon. Available in bright, vibrant colors that appeal to children, this spoon is a perfect baby registry item. Available colors: Green/Orange, Orange/Pink and Purple/Green. Product is BPA and phthalate free. Win It: Beaba is generously offering (1) 360 Spoon to a lucky winner!